I got the set of Kinyon plans from ABANA over a year ago and have spent a LOT of time studying them and the general concept for the hammer. I started scrounging materials for the hammer several months after getting the plans. First material found was 2 pcs. of 8″ X 8″ X .375″ wall tubing. I did a lot of searching on the internet for materials, especially the air cylinder. Most everyone else had cylinders 2″ X 10″ on their hammers, but I found a 2.5″ X 12″ for the right price ($32 and it was brand new) and got it to use. The only problem with the cylinder is that it has 3/8″ ports instead of 1/2″. This cuts down air flow to the cylinder and I may have to drill out or replace this cylinder in the future. A clean design was important to me as well as being able to adjust this hammer as much as possible to allow for top tooling or things that will come up that I had not even thought about. The tubing was clean, straight, heavy and made a nice appearing frame. Later the remainder of the steel was purchased (at a good price – it was already cut and had been laying in the back of the steel places shop for several years after their customer never picked it up. If you want to build a hammer there are lots of fabrication shops and steel suppliers around that have materials they will heavily discount if you look for them. I used a piece of 9″ diameter shafting for the anvil. This was found at a machine shop and was part of an old shaft that they replaced. Best of all price = free! The piece was only 26″ long however and I am 6′-2″ and did not want to bend over the machine in order to forge. So that meant raising the anvil somehow. 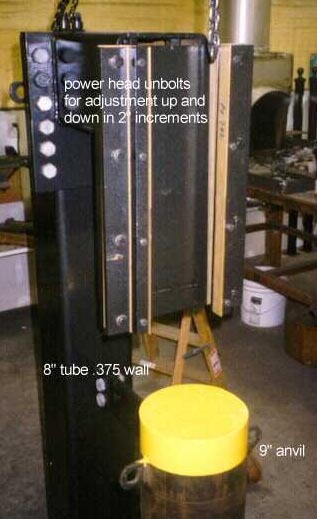 I found a 5″ thick base plate that measured 14′ X 32′ and used this. Using this heavy material added a lot to the mass of the hammer, therefore, giving better hammer results. This also kept the footprint of the hammer smaller than if I had used a thinner plate. A thinner base plate would have had to be larger to spread the impact and to keep the whole thing from tipping due to the top weights. I welded a 1″ base plate to the frame (tubing) and used 6 A325 bolts to bolt it to the 5″ base plate. I welded a 1″ base plate to the anvil and bolted it to the thick base plate the same way. Now, for adjustment on the top of the hammer (to allow raising and lowering the head in 2″ increments) I welded a 1″ plate to the frame, and another to one end of the power head. These plates had 6 holes each side for the adjustment. Another 1″ plate was welded to the other end of the power head with holes in it for the hammer guides to bolt to. The hammer itself is a chunk of 5″ plate that is 6-3/4″ X 11″. Weight is 120# (according to the charts, to damn heavy to hold on the bathroom scales!). the piece the cylinder is attached to was made out of a chunk of tubing left over from the frame. This piece bolts to the power head. I made the frame so it could be used as an auxiliary air receiver for the hammer. However, this will never have air put into it until I have the chance to water hydro. 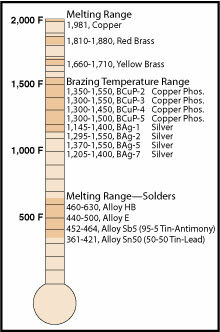 test the unit with water at 300 psig. If you are not a certified ASME code welder do not attempt this yourself, and then hydro the unit before using as a receiver! All parts were tack welded up and then completely assembled. The assy. was checked for plumb and level, dimensions, and alignment of all bolt holes, etc. Then dis-assembled and welded up. All the parts were pre-heated to about 250 degrees before welding except the anvil to its base. I pre-heated it to 400 degrees because I was not sure of the type material the shaft was. All welding was done with 7018 rod. 4-powerhead that can be further broken down by cylinder and hammer. This allows me to easily unbolt move or load onto a truck for taking to a hammer-in or demo.The latest control scheme worked up by Mike Linn and Jeff Sargeant of the Alabama forge council was used. 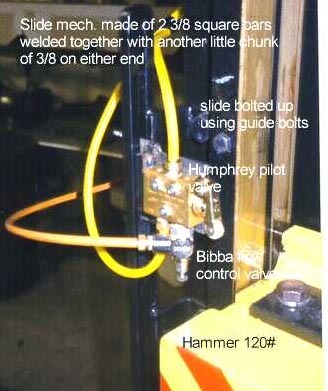 Control of the hammer is excellent, but I do not think much of the Humphrey pilot valve. Seems cheesy and I have already knocked mine off once. I am going to investigate other ways to activate a pilot valve (electrically, magnetically or ??). Until another method comes up I will put up with this one. If I do go to another method I will modify this document. One other adjustment feature is built into the hammer also that I better tell you about. Another hammer I know of uses a 10″ cylinder. After his hammer was made he had a slight oblique motion in the stroke, making the guides hard to keep in alignment. So he installed a part that is used to allow for minor misalignments. This part acts like the swivel foot on the end of a C clamp. The part took up 1-1/2″ of his stroke. This effectively cut the stroke of his cylinder to 8-1/2″ SOOOO — hmmmm I thought – how to allow for this if my hammer had the same problem? What I wound up doing is, the flat dies I made for the hammer (which are 2″ thick X 3″wide X 6″ long) were welded to extra heavy pieces that bolt to the hammer and the anvil. I made the bolt up pieces out of 1″ thick plate. Now when I install an alignment coupling like the other hammer (and I will HAVE to because – yes my hammer has some misalignment too) I can use a thinner base plate allowing me to regain that lost space and use the full cylinder stroke. I used an in-line filter, lubricator and regulator. The air supplying the pilot valve should be taken off before the lubricator. Oiling the pilot valve tends to make it behave erratically and can get very exciting, to say the least. Made a Kinyon style foot control. ALWAYS keep safety in mind. Wear eye protection and remember this thing will hurt you FAST if you don’t think about what and how you are doing things. I hope my “Beast” will give other’s ideas on how to go about building their own hammer’s. The best advice I can offer is to try to think how your hammer will be used and to build in as many features or adjustments as possible when fabricating. It’s a LOT easier to do then than later. If I can help in any way feel free to contact me. 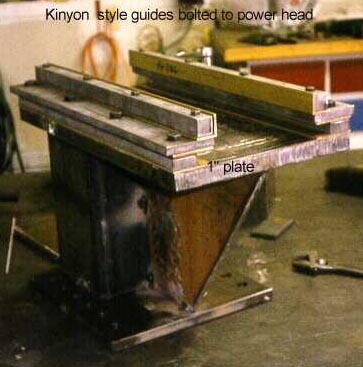 Kinyon style hammer plans are available through ABANA. These plans are not a detailed method of building a hammer but give you a very good concept of how to proceed using your own criteria to accomplish your goal.